Dr. P. Amrutha Rao completed MBBS from Gandhi Medical College, Osmania University in 1985. 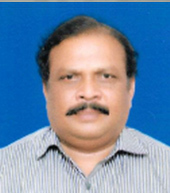 He also completed post graduate diploma in Public Health (DPH) from NTR University of Health Sciences in 1990. He joined in the department of Food and Drug Toxicology Research Centre of NIN in 1993. His area of specialization are, Public Health, Nutrition, Clinical Toxicology, Food Safety, Lathyrism and Food Borne Disease Outbreaks. He also participated in Iodine Deficiency Disorders (IDD) survey in North-East India. He is member of Nutrition Society of India (NSI), Indian Public Health Association (IPHA) and Indian Dietetics Association (IDA). Presented Oral Paper Presentation in Banaras Hindu University, Varanasi on "Lathyrism in South Central India". Presently he is in-charge of Nutrition Unit in Osmania General Hospital. He is also faculty member for MSc (Applied Nutrition) and taking the Students to the Nutrition Ward and explaining the Clinical Signs and Symptoms of Nutritional Deficiency Diseases. Amruth R P, Bhat R V., Lathyrus Sativus and human Lathyrism: Progress and prospects (Yosuf H K M, Lambien F Eds) Proc. 2nd Int. Colloq. Lathyrus / Lathrysim, Dhaka, 10-12 Dec, 1993. University of Dhaka, 239-242. Lathryrism in Vidarbha region of Maharastra – A rapid a Assessment, Ramesh V Bhat, Amruth Rao P, 1994. Foodborne disease in students’ hostel due to improper tin coating: A case study. Sudershan R V, Amruth RP, Bapu Rao S and Bhat R V. Journal of College and University Services.2: 25029, 1995. A foodborne disease outbreak due to the consumption of mouldy sorghum and maize containing fumonisin mycotoxins. Bhat RV, Shetty PH, Amruth RP and Sudershan RV. Journal of Toxicology (Clinical Toxicology), 35: 249-255,1997. Diet and Nutrition status of children in four tribal blocks of thane district in Maharastra, India (Nutrition status of children), A L Khandare, V Siruguri, A Rao, Venkaiah, G Reddy and GS Rao, Pakistan Journal of Nutrition 7(3) 485-488,2008. A prospective of street foods sold on special occasions in the household of south India. Kantha Vaghren, Ramesh V H and P Amruth Rao, International Journal of Food Science and Technology and Nutrition, Vol 2, no.1, 137-150, 2008.